People walk by the headquarters of 21st Century Fox, right, on June 13, 2018, in New York City. The Disney-MGM Studios logo, left, sits on a building Nov. 11, 2001, in Orlando, Florida. 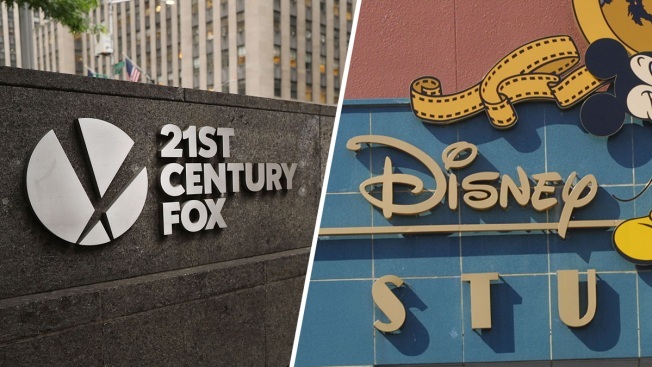 Disney's $71.3 billion acquisition of Twenty-First Century Fox's entertainment division is one step closer after shareholders approved the deal Friday. The tie-up brings together Marvel's X-Men and Avengers franchises and creates an entertainment behemoth in the digital streaming era. The shareholder vote caps a saga that began in December 2017, when Disney made its first offer for part of Rupert Murdoch's media conglomerate. It kicked off a bidding war with Comcast, which dropped out last week focus on attempted buyout of the European pay-TV operator Sky. The Fox deal will help Disney compete with technology players like Amazon and Netflix. The agreement is not expected to close for several months and still requires regulatory approvals.